Breast implant associated anaplastic large cell lymphoma (BIA-ALCL) is a cancer of the immune system caused by breast implants. It is generally found in fluid collection in between the implant and capsule, in a seroma, or in a nodule in the capsule. Physical signs are effusion, swelling, pain, inflammation, mass, ulceration, and others. The overwhelming symptoms in a majority of patients is a delayed seroma, persistent swelling, and pain. While even more rare some patients may present skin changes (rashes), lymphadenopathy, capsular contracture, or a potentially palpable mass.1 CD30 is the diagnostic test being used to distinguish BIA-ALCL. It is widely accepted that there is a direct correlation between textured implants and the development of BIA-ALCL. As of March 2019, there have been no confirmed cases of a BIA-ALCL in a patient with smooth only device, that is not to say it will not eventually happen. “[S]tudies reported in medical literature estimate that the lifetime risk of developing BIA-ALCL for patients with textured breast implants ranges from 1 in 3,817 to 1 in 30,000.” – FDA Update 3/21/18. As of February 8, 2019, these statistics are still current with the FDA and American Society of Plastic Surgeons (ASPS). As of February 8, 2019, the ASPS is aware of 688 unique cases and 17 deaths worldwide. This is based on a global network of international plastic surgery societies collaborating to share and track cases. There is a PROFILE registry, a joint collaboration between the FDA and ASPS/PSF to track BIA-ALCL patients. The ASPS reports that as of March 18, 2019, there have been 270 suspected/confirmed cases reported to the registry. These are included in the total 688 worldwide unique cases. In March 2019, the Patient Registry and Outcomes for Breast Implants and Anaplastic Large Cell Lymphoma Etiology and Epidemiology (PROFILE), Initial Report of Findings, 2012-2018 was published with a summary of the registry’s findings. FDA adverse event reports are another form of BIA-ALCL tracking. On February 6, 2019, the FDA released an update (FDA Summary of Raw MDR Data Received as of September 30, 2018) stating that as of September 2018, the FDA received a total of 660 medical device reports (MDRs) of BIA-ALCL – however after removing duplicates – 457 are considered unique BIA-ALCL reports. The FDA reports 9 deaths reported in the MDRs. These are part of the 17 known deaths worldwide listed by the ASPS. Join the Facebook group ALCL in Women with Breast Implants BIA-ALCL to view reports by country. The FDA MAUDE database contains adverse event reports involving medical devices. It includes voluntary, user facility, distributor, and manufacturer reports. Click here to see a sample of seven MAUDE BIA-ALCL reports submitted to the FDA. 1. Company rep reported right side anaplastic large-cell lymphoma and “subcutaneous nodules and lymph nodes. ” the pt had a bilateral reconstruction seven years ago with style 410 breast implant placed on the left side and a style 115 placed on the right side. The pt had done well until she presented last week with a pathology report from her oncologist stating that she had alcl. The pt stated that she had nodules on the right axilla. A pet scan was carried out that showed metastasis in the lung and bone marrow involvement. No seroma was noted. The oncologist has decided on her treatment plan to exclude radiation. Explant surgery will take place (b)(6) 2013. (Reported in 2013, Allergan silicone) Link. 2. Anaplastic large cell lymphoma of the breast arising around mammary implant capsule: an (b)(6) report written in aesthetic plastic surgery 2013 reports alcl, seroma, pain. Additional information noted in article anaplastic large cell lymphoma of the breast arising around mammary implant capsule: an italian report written in aesthetic plastic surgery 2013 article notes in regards to the right side, “necrosis and chronic inflammation signs are present” and “skin above the implant became red and painful and the patient had febrile episodes. ” treatment noted for the event of seroma as “a broad-spectrum antibiotic. ” (Reported in 2013, Allergan silicone) Link. 3. Healthcare professional reports a case of lymphoma and other b-symptoms via mw (b)(4) the mw notes that: “the reporter called on behalf of a pt who was diagnosed with alcl. The pt presented with anaplastic large cell lymphoma, diagnosed in 2013. History of hodgkin’s lymphoma diagnosed in 2011. These two events came about after the pt underwent breast augmentation in 1994. In 2010, pt presented with an abnormal mammogram performed in 2010. Breast pain, skin color change, skin texture change, and inflowing diffusion form the right breast up to right neck and shoulder. The pt was running a fever throughout the entire process. After an mri and subsequent test, the pt was diagnosed with hodgkin’s lymphoma and underwent mantle radiation. In 2012, the pt underwent surgery essentially for a breast mass, but the pt also desired a mastectomy for removal of right and left implants and capsules. The pathology of the operation soon reported that the pt also has alcl; the mass had come from the lymphoma. ” (Reported in 2013, Allergan saline) Link. 4. Pt is a female who underwent left mastectomy in 1996, for ductal carcinoma in situ with tissue expanders and saline implant reconstruction. She presented in 2010, with a peri-implant hematoma, though possibly post-traumatic. She underwent evacuation of the hematoma and change to a silicone gel implant. All pathology specimens were negative for tumor. She again presented in 2012, with a spontaneous hematoma and at surgery multiple biopsies revealed anaplastic large cell lymphoma (alcl) limited to the periprosthetic capsule and hematoma fluid. After an extensive hematologic and metastatic workup which was negative, she underwent removal of the implant and total periprosthetic capsulectomy. Capsular pathology showed alcl. (Reported in 2012, Mentor silicone) Link. 5. On (b)(6) 2010, diagnosed with anaplastic large cell lymphoma (alcl) alk-negative. Possibly related or caused by breast implants received in (b)(6) 2002 for augmentation. Experienced complications with left implant diagnosed as capsular contraction. Implant replaced on (b)(6) 2008. Still experiencing capsular contraction after replacement. (b)(6) 2010 – (b)(6) 2011: received 12 doses of chemotherapy, received 20 doses of radiation therapy. Preparing for stem cell transplant scheduled for (b)(6) 2011. 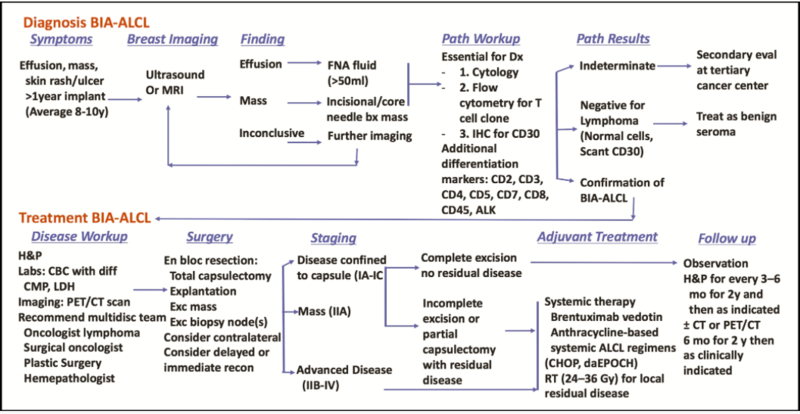 (b)(6) 2010: needle biopsy – diagnosis lymphoma. (b)(6) 2010: surgical biopsy – diagnosis alcl. (b)(6) 2010: surgical biopsy – diagnosis alcl. (Reported in 2011, Allergan saline) Link. 6. The original purchase date of this device was (b)(6)2004. In (b)(6) 2006, the pt was implanted with mentor siltex saline devices during a revision augmentation procedure. In (b)(6) 2008, the devices were replaced with mentor smooth saline devices due to a left device deflation. In (b)(6) 2010, the pt had both implants removed due to recurring fluid accumulation in the right breast. On (b)(6)2010, the pt was diagnosed with alcl (t-cell lymphoma). No further info is available at this time. (Reported in 2010, Mentor saline) Link. 7. It was reported by a physician that a (b)(6) year old female patient was diagnosed with alcl on (b)(6) 2017. This patient¿s medical history includes diagnosis of left breast invasive ductal carcinoma in (b)(6) 2015. She underwent bilateral mastectomy and bilateral tissue expander placement in (b)(6) 2015. The patient had mentor tissue expanders that were implanted from (b)(6) 2015. The patient then had mentor memory shape low high moderate plus profile breast implants (catalog #334-1507, r. Side serial # (b)(4)) implanted in (b)(6) 2015. On (b)(6) 2017, the patient experienced a large right breast effusion that developed over 24-48 hours. The effusion was aspirated and tested using flow cytometry and cd30 ihc and came back positive for bia-alcl on (b)(6) 2017. The time between patient signs/symptoms of peri-implant alcl to definitive diagnosis was 1 week. The patient did not have any complications such as infection, hematoma, or implant rotation during implant course prior to alcl diagnosis. The patient did not experience skin lesions, fevers, night sweats or weight loss. There was no pain, redness, palpable breast mass, or capsular contracture. The lymphoma cells were found in the seroma fluid surrounding the implant. Immunohistochemical and flow cytometry testing showed alk negative and cd30 positive results. This is a pathologically confirmed stage ie primary diagnosis of alcl. Based on histology, there is no capsular involvement. The lymphoma cells were found in the effusion fluid surrounding the implant. The patient underwent bilateral implant removal and capsulectomies with no implant replacement on (b)(6) 2017. The implants were intact and not ruptured upon removal. (Reported in 2017, Mentor Memory Shape Silicone) Link. “The recent FDA update of 457 reports included 24 (5%) smooth implant reports. This is similar to last year’s update of 414 reports in 2018 including 30 (7%) smooth implants and 359 reports in 2017 including 28 (8%) smooth cases, and 258 patients which included 11 (4%) smooth implant reports in 2016. 4. Additionally, in the Facebook BII Support Groups, there has not yet been a purely smooth implant case of BIA-ALCL. This is not to say that it is not possible, but that it has yet to be seen. Regardless of surface type, symptomatic women should be tested. The NCCN guidelines do not specify a surface requirement for testing. Any symptomatic woman that is denied testing should report their clinician to the appropriate medical board. In as early as 1997, lymphoma was first identified around breast implants in isolated cases. See the research article Breast Implants and Cancer. It was written that lymphomas and breast implants “deserve[d] further attention.” Unfortunately, it took nearly 20 more years for BIA-ALCL to be highlighted. Click here to read the Breast Implants and Cancer (1997) section on lymphomas. There have been several reports of lymphomas occurring among women with silicone breast implants; these reports are of interest because of evidence that implants can affect T-cell-mediated autoimmune reactions. At least four cases of cutaneous T-cell lymphomas have been reported among women with silicone gel breast implants ( 95 , 96 ). In several cases, the skin lesions began as eruptions overlying the implants, while in another instance a ruptured implant led to the diagnosis of pre-Sézary syndrome, which subsequently progressed to Sézary syndrome (a form of cutaneous T-cell lymphoma), leading to the suggestion that persistent antigenic stimulation might have been involved ( 96 ). Another report ( 97 ) noted a follicular mixed lymphoma adjacent to a surrounding granulomatous response in a woman who had painful capsular contracture. An additional case has been reported of a primary effusion lymphoma developing between a silicone breast implant and its capsule in the absence of a mass lesion in a woman negative for the human immunodeficiency virus ( 98 ). The histologic dissimilarity of the cancers in these reports argues against a common mechanism. Nonetheless, the risk of lymphomas among women with implants deserves further attention, given the reported immunologic disturbances following silicone exposure. The cause is still unknown but is actively being studied. Some researchers have theorized that biofilm (bacteria) contributes to lymphoma and others have thought the rough surface and chemicals in the implants irritate the immune system. Both theories rely on the presence of persistent inflammation, which means chronic activation of immune cells and particularly the T lymphocytes, which are white blood cells involved with BIA-ALCL. Throughout the body, there are many diverse populations of bacteria that are both beneficial and harmful. In recent years, there has been an increased focus in characterizing bacteria and analyzing patterns of bacteria to understand the possible correlation between normal versus infectious/cancerous scenarios – especially in relation to breast cancer. What has been discovered is that similar to how the gut has its own microbiome of good and bad bacteria, the normal breast tissue and human milk also have their own microbiology that over time is influenced by factors such as dietary and sugar changes. The article “Microbiota of the Human Breast Tissue” delves into the various specific bacteria that were found in human breasts. Since breasts are not sterile, if a foreign object is placed inside the body, it will be colonized and infected. Biofilm is bacteria that adheres to the surfaces of medical devices. It can result in a low grade chronic bacterial infection, chronic inflammation, and capsular contracture. Some bacteria produce acid as they grow and this reduces the pH of the surrounding environment. In the closed off space between the surface of the implant and the inner capsule surface, the bacteria coating the implant could form an acidic environment that contributes potentially to the breakdown of silicone. Australian researchers found that biofilm from capsular contracture cases was different from the biofilm identified on 26 implants from lymphoma patients. This brings biolfim to light as “a possible infectious contributing cause” for the lymphoma. The chemicals used in the manufacturing process, which are neurotoxic and carcinogenic, are also believed to be playing a role in the development of lymphoma. As of 2019, all BIA-ALCL cases have been found with textured implants, there have been no documented smooth only cases. The roughness of the surface is triggering chronic inflammation. Textured implants were designed to keep the implants in place, thus, the capsules embed themselves on and around the textured surface. This creates an intimate, hand in hand connection between the scar tissue and chemically abrasive textured surface. Over time, this can lead to a direct abrasive irritation of the immune system, significantly affecting T cells. Genetics has also been brought up but requires further investigation. Two published reports showed a genetic predisposition (germ line mutation in JAK1 and STAT3 genes). Proper protocol is the National Comprehensive Cancer Network (NCCN) guidelines, the recognized standard in cancer care. See 2019 NCCN Consensus Guidelines on the Diagnosis and Treatment of Breast Implant-Associated Anaplastic Large Cell Lymphoma (BIA-ALCL). Figure 1. Breast implant-associated anaplastic large cell lymphoma disease algorithm. Very important to have full capsule removal with textured implants. There have been at least two cases of BIA-ALCL in the ALCL in Women with Breast Implants BIA-ALCL patient support group where women had textured implants removed but had capsules left in and were later diagnosed with BIA-ALCL. The determination for chemotherapy is related to how much of the cancer is contained and able to be surgically removed versus if it is past the capsules and spreading. For some women the cancer is contained in-situ in a seroma (fluid collection) within the capsules or as a capsular tumor or palpable breast mass that can be surgically removed. For others it can be an infiltrative disease that cannot be surgically removed such as a mass outside the capsule, lymph node involvement (with or without breast mass) and rarely distant metastases – these cases would involve chemotherapy. Infiltrative disease may occur with or without a seroma. It’s not yet entirely understood if in-situ develops into infiltrative disease or if they are two distinct entities. In 2018, an admin of the Facebook ALCL in Women with Breast Implants BIA-ALCL patient support group commented that about 30% of diagnosed women in the group needed chemotherapy in addition to removal of the capsules and implants. There are two main forms of chemotherapy available: CHOP (or CHOEP) and the more expensive Brentuximab. If women fail to respond to CHOP (about 50%), they then qualify for Brentuximab. The side effects of Brentuximab seem to be more tolerable and overall the preferred choice among women. There have been cases reported in the Facebook ALCL in Women with Breast Implants BIA-ALCL patient support group where mammograms have triggered breast swelling and led to BIA-ALCL diagnoses. Credit: This information is being shared via the ALCL in Women with Breast Implants BIA-ALCL Facebook support group and their advocacy website, BIAALCL.com. Click here to see a list of scientific articles. PSEN Breast Implant Associated Anaplastic Large Cell Lymphoma (2017). Link. United States Epidemiology of Breast Implant-Associated Anaplastic Large Cell Lymphoma (2017). Link. Breast implant associated Anaplastic Large Cell Lymphoma in Australia and New Zealand – high surface area textured implants are associated with increased risk (2017). Link. Breast implant-associated anaplastic large cell lymphoma (2016). Link. Diagnosis and Management of BIA-ALCL (2016). Link. BIA-ALCL, The French National Cancer Institute Expert Opinion (2016). Link. A further case report from the United Kingdom of breast implant associated anaplastic large cell lymphoma (BIA-ALCL) and a reason to avoid the sub pectoral plane (2016). Link. Breast implant-associated anaplastic large cell lymphoma: two distinct clinicopathological variants with different outcomes (2016). Link. Marked eosinophilia as initial presentation of breast implant-associated anaplastic large cell lymphoma (2016). Link. Scar capsule around breast implant must be removed if you want it insure you don’t have problems years later, including BIA-ALCL Here is a case of BIA-ALCL years after implants were removed. MSCs and inflammation: new insights into the potential association between ALCL and breast implants (2016). Link. Biomarkers Provide Clues to Early Events in the Pathogenesis of Breast Implant-Associated Anaplastic Large Cell Lymphoma (2016). Link. Whole Exome Sequencing Reveals Activating JAK1 And STAT3 Mutations In Breast Implant-Associated Anaplastic Large Cell Lymphoma Anaplastic Large Cell Lymphoma (2016). Link. Axillary Lymphadenopathy: An Outstanding Presentation for Breast Implant-Associated ALK-Negative Anaplastic Large Cell Lymphoma (2015). Link. Effusion-associated anaplastic large cell lymphoma of the breast: time for it to be defined as a distinct clinics-pathological entity (2010). Link. Complete surgical excision is essential for management of patients with breast implant-associated anaplastic large-cell lymphoma (2016). Link. Bacterial biofilm infection detected in breast implant–associated anaplastic large-cell lymphoma (2016). Link. Breast implant-associated anaplastic large cell lymphoma: a systematic review (2015). Link. Recurrent systemic anaplastic lymphoma kinase-negative anaplastic large cell lymphoma presenting as a breast implant-associated lesion (2015). Link. The non-specific symptoms of breast implant-associated anaplastic large cell lymphoma resulting in delayed diagnosis: a case-based review (2015). Link. CD30 expression in de novo diffuse large B-cell lymphoma: a population-based study from British Columbia (2014). Link. The significant association of CD30 with EBV-positive non-GCB DLBCL suggests a distinct pathobiology for these cases. Breast implant-associated anaplastic large-cell lymphoma: long-term follow-up of 60 patients (2013). Link. Implant-associated anaplastic large cell lymphoma of the breast: insight into a poorly understood disease (2013). Link. Breast implant associated anaplastic large cell lymphoma: a case report and reconstructive option (2013). Link. Breast implant-associated ALK-negative anaplastic large cell lymphoma: a case report and discussion of possible pathogenesis (2013). Link. Anaplastic large cell lymphoma, ALK-negative (2013). Link. Chemotherapy-resistant breast implant-associated anaplastic large cell lymphoma (2013). Link. Breast implant-associated ALCL: a unique entity in the spectrum of CD3o+ lymphoproliferative disorders (2012). Link. Survival Signals and Targets for Therapy in Breast Implant–Associated ALK− Anaplastic Large Cell Lymphoma (2012). Link. Primary anaplastic large-cell lymphoma associated with breast implants (2012). Link. Anaplastic large cell lymphoma involving the breast: a clfinicopathologic study of 6 cases and review of the literature (2009). Link. Primary and secondary T-cell lymphomas of the breast: clinico-pathologic features of 11 cases (2009). Link. Primary anaplastic large cell lymphoma of the breast arising in reconstruction mammoplasty capsule of saline filled breast implant after radical mastectomy for breast cancer: an unusual case presentation (2009). Link. Rare lymphoid malignancies of the breast: a report of two cases illustrating potential diagnostic pitfalls (2000). Link. Understanding rare adverse sequelae of breast implants: anaplastic large-cell lymphoma, late seromas, and double capsules (2016). Link. Seroma-associated primary anaplastic large-cell lymphoma adjacent to breast implants: an indolent T-Cell lymphoproliferative disorder (2008). Link. Malignant lymphoma and breast implants: a case of diffuse large b-cell lymphoma (DLBCL) with implant-near relapse localization (2010). Link. Intravascular large B-cell lymphoma associated with silicone breast implant, HLA-DRB1*11:01, and HLA-DQB1*03:01 manifesting as macrophage activation syndrome and with severe neurological symptoms: a case report (2016). Link. Anaplastic large-cell lymphomas of B-cell phenotype are anaplastic lymphoma kinase (ALK) negative and belong to the spectrum of diffuse large B-cell lymphomas (2000). Link. 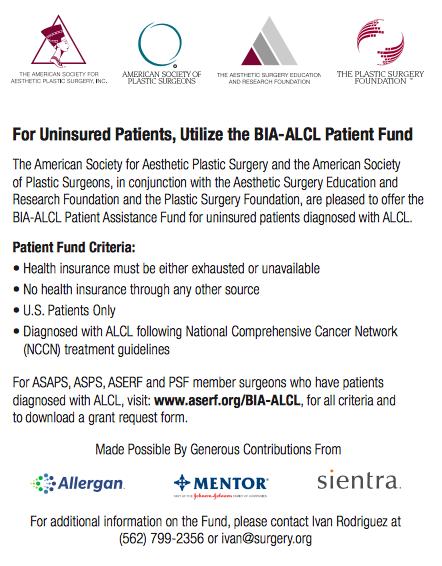 There is funding available for uninsured patients diagnosed with BIA-ALCL. It is funded by all three US manufacturers: Allergan, Mentor, and Sientra. It is for US patients only and a requirement is that the patient be diagnosed following the NCCN guidelines. This information is from the Aesthetic Society News Quarterly Newsletter of the American Society for Aesthetic Plastic Surgery, Spring 2018, page 54. Submit case report of BIA-ALCL to the PROFILE Registry to contribute to a better understanding of the causes and treatments of BIA-ALCL. ALCL in Women with Breast Implants BIA-ALCL and their advocacy website, BIAALCL.com. BIA-ALCL Clinician/Patient Discussion Group. Only for women diagnosed with BIA-ALCL and clinicians. There are BIA-ALCL lawsuits filed and more to come in the future. Attorney Dena Young Lebovic with Ross Feller Casey is currently filing these cases. Dena and co-counsel have 50+ BIA-ALCL cases filed in the New Jersey Superior Court. See Lawsuits for more information. Thank you for sharing your diagnosis. What were your symptoms? What manufacturer and type of implant (smooth or textured) did you have? Please report it to the FDA and BIA-ALCL Profile Registry. There is a Facebook support group called ALCL in Women with Breast Implants BIA-ALCL with 60+ other women who have been diagnosed with ALCL.